Summer is in full tilt here in Northern Michigan and we are busy, busy, busy traveling and visiting. You're on your own. And you know what you know. The Books for Walls Project wants to know more about this wonderful world and we want to learn from you. Where is the furthest place you've traveled from home? Tell us a story all about the trip. We went to California for our friend's wedding -there were people there from Paris and it was a Jewish and Vegetarian wedding --it was the best wedding we've ever been too! We stayed in a really nice hotel, we spent time with cousins I'd never met and rode my Italian Uncle's horse (her name is Misty) and on my Dad's birthday we went to the ocean and met an old friend of Mom's. I like California because it is mostly sunny and the ocean and all the bridges! In the next couple of years I want to have gone to Italy, France (Paris), Spain and Greece. We are learning how to travel and to pack LIGHT! What did you like about California? The seals that I saw. They were floating on a wooden dock and were were watching with my cousin Leah -I really like Leah! Oh yeah! I can pack light --Mom packs heavier than Big Sis! When we travel I like swimming at hotel pools! What did you like best about California? Seeing the ocean and seeing the fog rise. I loved the Golden Gate Bridge, it was kind of scary but fun --I wonder if there are sharks in San Francisco Bay!!! I got my first Abalone shell from Uncle Denis -I think the shell will make a good bathtub for fairies. The next place I want to go is Paris France, this year in school we are learning more French! Furthest from home, hmmmm, I have gone places I felt far from home... like my first summer camp -I was so thankful to have my older sister with me! --But furthest on the map is Spain. 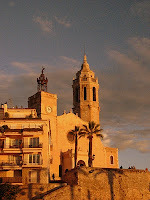 In 1998 we (the Dad and I)had two magnificent weeks in Sitges and Barcelona. My brother moved there (he still lives in Europe)and we visited him... seeing all the old, architecture blew my mind, I fell in love with Gaudi and look forward to visiting again and learning to handle heights to I can walk to the top of Sagrada Familia. In Europe I learned that I am a home-body, but I love to travel... so The Big Sister and I are learning how to take a bit of home wherever we go so that we can explore the world and still nourish our inner home-body! When I was in my late 20's and newly married, I decided that I wanted to travel to Europe and have a baby before I turned 30 - that was the goal. My younger sister Amy (aka "Seester") was just graduating from college so we decided we better make a trip together before our lives became so complicated we would have too many excuses not to. After much discussion we decided on visiting England, Ireland, and Scotland together. We bought our tickets, packed huge backpacks, borrowed travel books and made a list of hostels. We were traveling women, vital and free with no one to answer to except ourselves. When we made it to London, we stayed with some Indian friends and it was in this first leg of the trip that I found out I had accomplished both goals at once - I was pregnant! Time zone issues and crackly overseas calls later, I shared the wonderful news with my husband and made him promise not to tell anyone until I got back. He later shared that he told as many complete strangers as possible because he was bursting with the news. London was vibrant and amazing. My sister and I both fell in love with Kew Botanical gardens and had such a lovely time with our hosts and their friends. From there we flew to Ireland and spent days in and around Dublin. Beautiful people, culture and music, funny hostels populated with people from all around the globe. Next it was on to Scotland where we researched the McLachlan clan, visited Loch Lomond, wandered in gardens, tried to master the accent, and fell in love with the Highlands (and a tiny bit with our tour guide Ewan). So very green, wild rhododendrons everywhere, stone cottages and sheep around every curve. It was a trip I will never forget. A trip of a lifetime with my dear seester. The trip where I had the joy of discovering I would be a mother. Eva loves this story and the idea that she was there with us too. Thanks for this challenge and the opportunity to enjoy this memory today. It was in Australia that I first learned the term "no worries" and just how crucial the notion of being genuinely happy really is. The folks we bumped into, in ever facet of the society were kind, jovial, on the verge of belly-laughter, and certainly happy to make our acquaintance. It's in Basque country in northern Spain. Mysterious, powerful. Thinking of distance as in time, not space. Life in a by-gone world! Check out this little town time forgot... complete with a mysterious legend of its own Catholic Saint, Bigitta. Vadstena (vahd-STEE'-en-uh), Sweden. and a surreal moment: my husband and I had dinner in a Chinese restaurant in the Austrian Alps while listening to a Willie Nelson song playing on the sound system. Indeed, the globe is very small! I used the internet site http://www.mapcrow.info/ to see whether Sitges or Valencia, Spain was farther from Detroit, where I lived at the time of travel, than Zell-am-See. Zell-am-See won by over 200 miles! The Internet is marvelous! with horses and hand prints sketched on the walls telling of ancient warrior hunts and manhood rituals. Travelling back eons, my being imagined the shaman making ceremonial movements; swaying while chanting for food from a good hunt. And other times when the shaman prayed over boys soon to be men and prepared them for their first hunt. The boys huddled in the dark fearful yet exhilarated by the experience. In the darkened space, the distant cave entrance appeared surrounded by light and an aura of hope; for me this was not a cave, but a sanctuary.